This 4-bedroom villa for up to 8 guests is located in Gerani and has a private swimming pool. Gerani 7 km from Rethymno: Very comfortable villa Dafni, 2 storeys, built in 2000, renovated in 2015. On the outskirts, 7 km from the centre of Rethymno, 2 km from the sea, 2 km from the beach. Private: property 350 m2 (fenced), beautiful garden to relax, swimming pool with privacy (36 m2, 01.05.-31.10.). Paddling pool, outdoor shower, garden furniture, barbecue. 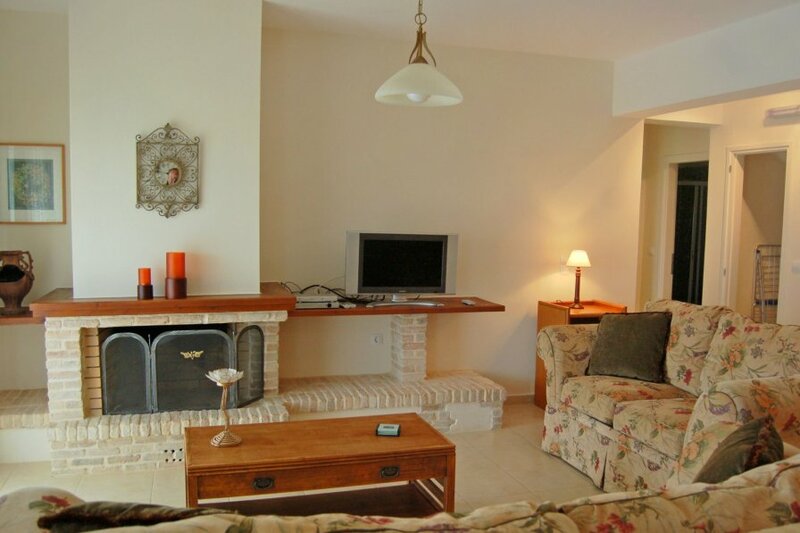 In the house: internet access, WiFi, air conditioning, washing machine, bicycles available bicycle rental. Linen change 2 times per week. Towel change 2 times per week. Room cleaning 2 times per week. Parking at the house. Shop 1 km, grocery 7 km, supermarket 1 km, shopping centre 7 km, restaurant 1 km, bar 7 km, bakery 1 km, cafe 1 km, sandy beach Gerani 2 km. Sports harbour 5 km, marina 5 km. Please note: car recommended. Suitable for families, baby equipment on request (included). Dafni, 5-room villa 156 m2 on 2 levels. Spacious and bright, stylish and wooden furniture furnishings: living/dining room with open-hearth fireplace, dining table, satellite TV, CD-player, DVD and air conditioning. Exit to the garden, to the swimming pool. 1 double bedroom with 1 double bed and air conditioning. Exit to the garden. Large, open kitchen (4 hot plates, oven, dishwasher, microwave, electric coffee machine). Bath/shower. Upper floor: 1 double bedroom with 1 double bed, bathroom and air conditioning. Exit to the balcony. 1 double bedroom with 2 beds and air conditioning. 1 double bedroom with 1 double bed and air conditioning. Exit to the balcony. Bath/shower. Comfortable furnishings in the country house style. Terrace furniture, balcony furniture, barbecue. Marvellous panoramic view of the sea, the mountains and the countryside. Suitable for families.